Get Aeromax 100S Specifications and Installation Manual pdfs by clicking the download buttons. Or, read about the intercom's features below without leaving this page. INDOOR LONG-RANGE WIRELESS INTERCOM SURFACE-MOUNT UNIT. Hands free, full duplex audio with background noise immunity. Powerful 900MHZ technology. 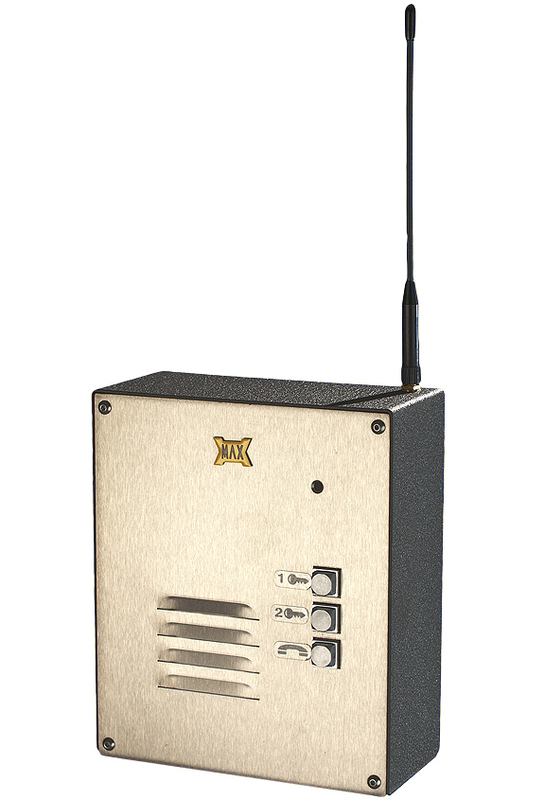 The Aeromax 100S is Maximum Controls indoor long-range wireless intercom surface-mount unit. It is capable of long-range audio communication up to 4000 ft (direct line of site). Super-clear hands-free full duplex audio based on 900 MHZ (1000mW) technology which is used for military application and can penetrate through buildings, trees, walls and any weather conditions. Works with all electric gate openers (Apollo, Chamberlain, etc.) Combine with outdoor Aeromax model #s 200 and 200K. This area is here to create space. This area is here to create space.This area is here to create space.This area is here to create space.This area is here to create space. Two different choices for outdoor wireless intercoms: one with keypad, one without. Two different choices for indoor wireless intercoms: surface mount indoor enclosure or desk top unit.